*This post has been created in Partnership with the American Lamb Board. 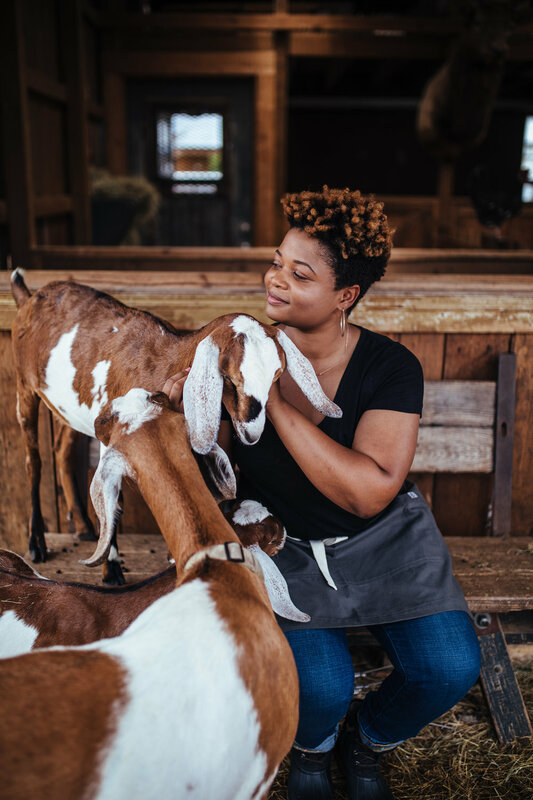 I'm excited to partner with the American Lamb Board and create some delicious recipes for y'all to try. I know, lamb can be intimidating. I'm sure we all had that bad experience, but I want you to know that all hope is not lost! For this recipe I paired the lamb rack with flavorful artichokes and potatoes. I used fresh artichokes, but you are more than welcomed to use canned. They were braised in lemons, wine and aromatics and I decided to cooked the potatoes in the same cooking liquid. Which equals you not tossing out all of the flavor and one less dish to clean! If you have never tried lamb rack you need to. It's a lean cut of the lamb and also a rather small in size, which means a shorter cooking period. Also, by it being lean, it is also mild in the gamy flavor a lot of people might be familiar with when cooking lamb. When cooking, I love to have some type of sauce to go with my food. Lamb, artichokes and potatoes are a well-known combination that works wonderfully together. I wanted to bring everything together with a delicious garlicky aioli. Be sure to check out the American Lamb Board for more delicious lamb recipes! Prepared a bowl with enough water to cover the artichokes. Take the lemon halves and squeeze the juice into the water and place aside. Prep the artichokes by removing the tough outer leaves until you reach the yellowish leaves. With a paring knife, cut off the end of the stem and trim the stem and base until you reach the light green leaves. Cut off about 3/4 inch from the top and cut in half lengthwise. Scoop out the choke ( the fuzzy part) if their is one. After trimming and cutting each artichoke, make sure to place into the prepared lemon water. In a large pot over medium-heat, add the water, salt, white wine, bay leaves, thyme, garlic and lemon strips. Add the artichokes and bring to a boil. Add the artichokes and cook for 10-15 minutes until tender. Remove with a slotted spoon and let drain on a rack lined with paper towels. Place the potatoes into same cooking liquid and cook for 15-20 minutes until tender but not falling apart. Remove and let cool. Gently smashed potatoes with the palm of your hand. Toss potatoes and artichokes with olive oil and season with salt and pepper. Spread the potatoes and artichokes out evenly on a sheet pan. Bake until crispy, 20-25 minutes. Let cool slightly and sprinkle with chopped chives and kosher salt. In a bowl combine the mayonnaise, lemon, garlic, salt and pepper, place aside. Add 1 tablespoon of olive oil in a heavy bottom skillet over medium high heat, sear lamb rack, fat side down until golden brown 6-8 minutes. Remove from heat. In a bowl, combine dijon mustard, honey and mix. Brush the mixture on top of the lamb. In same bowl combine the butter, rosemary, thyme, garlic and bread crumbs. Mix thoroughly until a paste is formed and spread evenly on top, pressing gently to make sure everything adheres. Place lamb in oven and cook for 25-35 minutes until the internal temperature registers 128 -degrees to 130 degrees. To serve, place a dollop of aioli on the bottom, top with the artichokes and potatoes and then the lamb. Add more aioli and enjoy! * This post is sponsored by Mina. Thank you for supporting brands that I love and make this possible. Shrimp and grits gets a remix! I remember the first time trying Harissa and thinking about how much zip and flavor it contained. If you are not familiar with this fiery condiment, it is chili pepper paste made with chili peppers, garlic, olive oil and spices. When I first tried Mina Harissa I loved the freshness of the product! It packs a punch and has the right amount of heat. So why not add it in one of my favorite things to cook, grits! This recipe for shrimp and grits not the shrimp and grits you know. Inspired by Moroccan and Tunisian cooking, I used Mina Harissa and also made the flavorful chermoula relish. If you are looking for bold and delicious flavors. I always wanted to make chermoula and I'm so glad I did..it paired wonderfully with the shrimp, fresh peas and roasted cherry tomatoes. For Chermoula think bright parsley, cilantro and fresh mint leaves, with earthy cumin, preserved lemons and smoked paprika. In a blender or food processor, add the cilantro, parsley, mint, garlic, preserved lemon, lemon juice, cumin, paprika, and cayenne. Pulse until all ingredients are finely chopped, making sure to stop and scrap down the sides. With the motor running, slowly add in the olive oil. Season with salt and place aside. In a pot add the grits and water and cook for 30-45 minutes until grits are tender (you may need to add a little water along the way). Once grits are tender, add in the Harissa, heavy cream, butter, chives and salt. While the grits cook, preheat oven to 400°degrees. Toss cherry tomatoes in a little olive oil and salt. Roast until blistered, 10-15 minutes. In a heavy-bottom skillet heat olive oil and when hot add the shrimp. Sear shrimp on one side for 3-4 minutes over high heat, turn heat down and flip shrimp. Add the garlic, lemon juice, 3 tablespoons of chermoula, and cook for 5 minutes. Add peas and tomatoes and heat through. Spoon some of the grits in a bowl and top with the shrimp chermoula mixture. Garnish with more chives and butter if you please! I was craving a crispy fish sandwich from McDonald's but got the bright idea to make my own. Because, how hard can it be? Well, it wasn't that hard at all because this sandwich was SO GOOD and worth it! If there is one thing I would change, it would be to not make massive size patties! Yes I went a little bit overboard with them! Seriously y'all, this is so simple and so tasty! 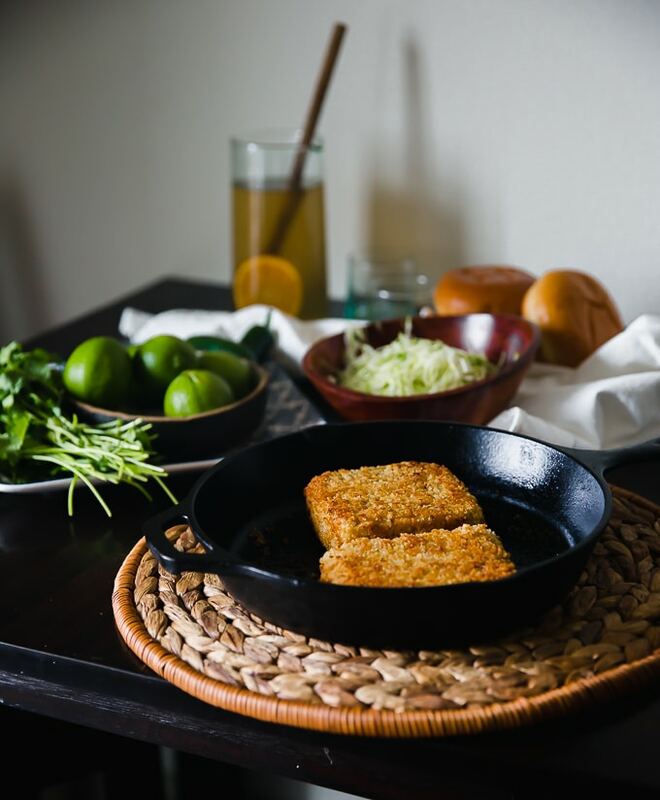 These crispy fish patties are going to be on rotation for me during the warm weather. I'm even going to look into freezing patties to have a supply stash. They would be good as fish bowls if I want to be a tad healthy. I haven't even gotten to the sauce yet and how amazing it is! I charred some jalapeños, minced them up and mixed with sour cream, mayo, cilantro, lime juice and just a pinch of sugar--that is it! The flavor of charred jalapeños and the sauce paired wonderfully with the crispy fish. I used cabbage as my "greens" but you can use romaine or leaf of choice. I love cabbage with fish, think delicious fish tacos with thinly shredded cabbage. Tilapia doesn't have to be used, you can use your flakey fish of choice if your not a fan of tilapia. All you do is steam until cooked all the way through--remember be gentle when removing it! We still want some notable pieces. I then mixed it with seasoning, an egg, a bit of flour and some panko bread crumbs. Place it into a pan lined with plastic wrap and let it chill for at least an hour. Cut into desired size and then batter and pan fry! You then have your very own crispy fish patty! 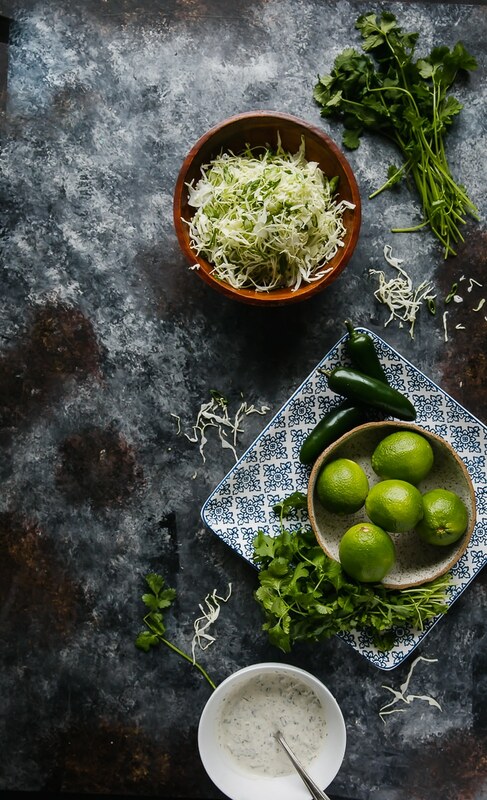 Get your buns, some shredded cabbage and the tasty charred jalapeño lime dressing! Place your fish fillets in a steamer basket and steam for 15-20 minutes until cooked through. Cooking time with vary depending on size and thickness. If you don't have a steamer basket. Place the fillets in a pan with a little water. Cover with foil and bake for 15-20 minutes at 350 degrees. Once fish is cooked, let cool and flake with a fork. Place in a bowl and set aside. Crack egg into a bowl and add the, garlic, onion, white pepper, creole seasoning, old bay, cayenne pepper and kosher salt. Whisk until combined and then pour over the fish. Add the flour and panko bread crumbs and gently fold into the fish making sure not to shred the fish too finely. You can either mold the mixture into patties or place into a baking pan line with plastic wrap. Refrigerate for at least 1 hour. While fish chills, make the dressing. Mince the charred jalapeños and add to a bowl (keep the seeds if you want the heat), add the sour cream, mayo, cilantro, lime juice and sugar. Mix until combined and set aside. Line a baking sheet with paper towels to absorb the oil from frying. Set up a breading station with three containers. Place the flour and old bay in the first container, the eggs in the second and panko in the third. One at a time, dip the fish patty in the flour, coating evenly, and then in the eggs, making sure to let the excess drip off and then finally roll into the panko. Repeat the steps until finished. In a heavy bottom pan, pour in oil until it comes halfway up sides of pan. Heat to 350 degrees. Fry the patties turning them gently until deeply golden on all sides. Transfer to the prepared baking sheet. The great thing about this oyster stew is that it is pretty quick to put together. My friends always tease me about how I describe anything that I'm cooking as "easy or quick" but I promise you that this oyster stew will make a quick and delicious meal. Think a creamy béchamel sauce, fennel, onions, celery, potatoes and garlic. A little bit of Pernod to deglaze the pan and then smokey and fatty smoked sausage to pair with the briney-oysters. So good! I speak on added texture to food often, so for this oyster stew I made some garlic croutons that I crumbled on top--you can't go wrong there. Preheat the oven to 350 degrees. Place baguette cubes, a drizzle of olive oil, creole seasoning and garlic in a bowl and mix well. Place on lined sheet pan and bake in the oven for 15 to 20 minutes until golden brown. Place aside and let cool. In a 12 quart saucepan, add the smoked sausage cook until nicely browned. Remove and drain on paper towels. Stir in the onions, celery and fennel and cook until soften. Add in Pernod and cook for 2-3 minutes until alcohol cooks out. Add the butter and then the flour. Cook for 2-3 minutes. Pour in the milk and add the salt and potatoes. Cook until potatoes become tender. Add heavy cream, oysters and liquor and seasonings. Cook on low, for 5-6 minutes to just poach the oysters. Taste for seasoning and serve in a bowl with the croutons. In honor of Black History Month, I had the opportunity to partner with 28 other amazing black food bloggers to participate in an awesome virtual potluck! For the Black History Month Virtual Potluck, each food blogger is showcasing a recipe that will get your taste buds tingling! I have looked at last years bloggers and recipes and my mouth was drooling and loving all of the different cultures and cuisines represented. From African to Jamaican and so on! A big thanks for Meiko Drew over atMeiko And The Dishand Aaron Hutchenson over at The Hungry Hutch for putting this together! For y'all I have made a classic Creole Courtbouillon (Coo-Be-yon) .This is a dish I remember having growing up, mostly with catfish being used, but it was always a dish I loved. Very much so a Creole influence with the stewed tomatoes. 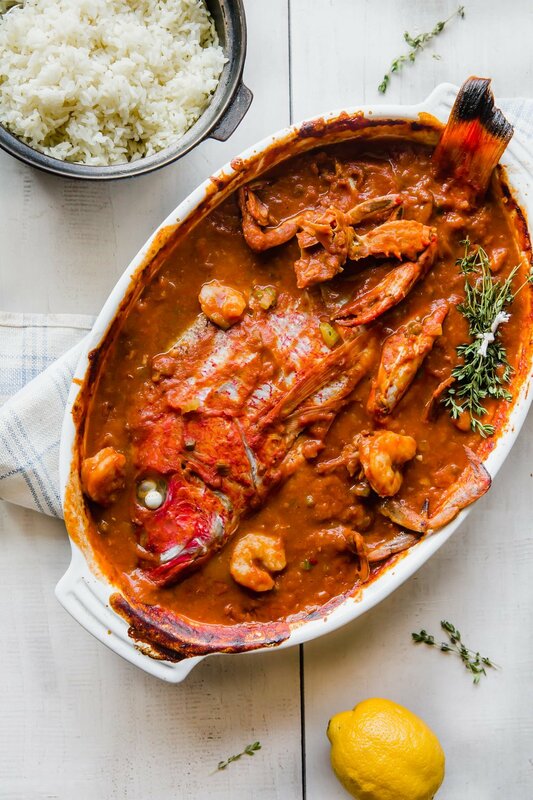 The fish is nestled in a bubbly creole tomato sauce seasoned with the trinity, roux, seafood stock and a splash of white wine. But, it does not stop there. Luckily I had some blue crabs in the freezer and threw some of them in along with some shrimp. The perfect meal. Any fish can be used. I love using red fish but only found red snapper out here, so feel free to use whatever you are able to find in your area. Please make sure to scroll below and check out the other great bloggers and their recipes! Preheat oven to 350 degrees. Score fish on both sides and then season with salt and black pepper and place in a roasting pan. In a pan over medium heat, add your roux. Add the onions, bell peppers and celery. Cook for 5-6 minutes and then add garlic, blue crabs, wine, creole seasoning and red pepper flakes. Cook for 3-4 minutes. Increase the heat and add the can of tomatoes, shrimp stock, tarragon, and bay leaves. Bring to a boil and season with salt, pepper and Worcestershire sauce. Pour creole sauce over the redfish and cover with foil. Bake for 35-40 minutes. Remove foil and add shrimp and oysters (if using) around fish and bake uncovered for another 15-20 minutes. Serve with rice and green onions. Cajun Jambalaya is one of my favorites. Cajun Jambalaya is different from Creole as it tends to not have tomatoes or seafood--basically just meat and more meat. I love Jambalaya and honestly after trying this wondered why I do not make it enough. With Mardi Gras right around the corner I remember my parents cooking hearty meals for us to take on the parade routes and also to have once we got home. This recipe is perfect to have any day. Y'all know how much I love D'Artagnan Foods and a big thank you for them for sending me their delicious andouille sausage, tasso ham and chicken confit leg. All these delicious meats, went into the making of this popular Cajun rice dish. The great thing about Jambalaya is that you can add a lot of different ingredients and make it your own. I wanted something different, because I would always put seafood in everything. So, here is a recipe for a classic meaty rice dish with all the right flavors. In a heavy bottom cast iron pot, add bacon and cook for 5-6 minutes, until lightly browned and fat rendered out. Add in the andouille and tasso and cook for another 5-6 minutes, making sure to get a nice color on the meat. Add chicken thighs and cook for another 5-6 minutes. Add the onions and cook, stirring frequently, until softened, about 5 minutes. Add in the bell pepper, celery and garlic and cook for 5 minutes. Stir in the rice, granulated garlic, celery salt, bay leaves, creole seasoning, cayenne pepper, thyme, smoked paprika and salt. Toast spices for 3 mintues. Add in stock and bring to a boil over high heat. Reduce the heat to low, cover and simmer until the rice is tender, about 20 mintues. Fold in the scallions and serve. Yakamein or "Old Sober" is a soup I had growing up. Reminiscent of pho, it is a simple no-fuss soup. Often using beef chuck roast and simmered slowly until tender with aromatics of garlic and onions. Some beef bouillon for added beefy flavor. And served with spaghetti, ketchup (yes ketchup), a hard boiled egg and a heavy sprinkle of green onions. The history of Yakamein is not truly understood. Some say it was brought back by the soldiers from the Korean War. And others state that it was introduced to New Orleans from the Chinese immigrants. Whatever the case, I'm glad it came to be. For my Yakamein, I wanted to make my own spaghetti--since I have been neglecting my pasta maker, but your favorite store brought spaghetti will do. I added ginger to my broth, picked up a chuck roast and decided to add some beef back bones. There are also some recipes that use pork or both beef and pork. Some would also throw in shrimp. I hope y'all try this delicious yet simple soup that I had growing up and enjoy it just as much as I did and still do! Place the chuck roast and beef ribs in a large stock pot or slow cooker and cover with water. Add creole seasoning, dried peppers and over medium-high heat, bring to a simmer, then reduce the heat to low and simmer for 3 to 4 hours, until the beef is tender. Remove beef and cube the chuck roast, place aside. Season broth with ginger, soy sauce, beef bouillon. Simmer for 5-10 minutes add beef back in and taste and adjust to your liking. In a bowl add the spaghetti with some beef and broth. Garnish with onions, green onions, boil egg and ketchup or Sambal. Enjoy! If your Creole seasoning contains salt, be sure to cut back the salt in either the soy sauce or beef bouillon. The new year is here and I'm looking forward to it! I'm also looking forward to making this whiskey dijon brined pork loin again! Whisky, maple syrup, dijon mustard, and spices subtly seasoned the pork loin and made it extremely moist. Pork loin is one of those cuts people are on the fence about. It can be overcooked and dry, especially since it does not have a lot of fat, but I found that brining works beautifully for this particular cut. It was brined over night. I've heard some horror stories of brines gone wrong. The basic ratio for brining is 1 cup of salt to 1 gallon of water. Another important note is to make sure you are measuring the salt you use. Each brand of salt varies in weight. Morton and Diamond Crystal are the main stream brands. I highly do not recommend brining with table salt or even cooking with it. But if it is what you have on hand, make sure to weigh out the quantity. To finish off the pork, you make a quick whiskey mustard glaze and you are off to a delicious meal! In a pan over medium heat, toast your coriander, black peppercorns, yellow mustard seeds for a few minutes until they become fragrant. Add in your water, whiskey, garlic cloves, thyme, salt, sugar and dijon mustard. Bring to a boil and stir making sure the salt and sugar is dissolved. Remove from heat and add the ice to chill down the brine. In a large zip lock bag add your pork loin and the chilled brine. Place in a large bowl or pot and then into the refrigerator. Make sure the pork is fully submerged in the brining liquid. Bine for 6-8 hours. In a pot combine the whiskey, syrup, whole grain mustard and dijon mustard. Bring to a boil and then lower heat and simmer for 4 minutes then remove from heat. Preheat oven to 400 degrees. Remove pork from brine and dry off with paper towels, bring to room temperature. Brush 1/4 cup of dijon mustard on top and sides of pork loin. Place in oven for 25mins. Lower temperature to 350 degrees and cook for 25 mins. Baste pork with glaze every 5-6 minutes. Pork internal temperature should be 135 degrees. Remove from oven and let rest for 5-10 minutes. Slice and serve with glaze. Enjoy! Braised brisket with all of its delicious gravy glory over some creamy herb grits!!! Yasss! This dish reminds me of one of my favs when growing up. Anything gravy over some buttery grits makes me happy. I remember leftover smothered pork chops becoming breakfast in the morning. Or even better, leftover pot roast! This dish is so decadent and homey-feeling--especially with the tempertures dropping. I can't wait to make it with short ribs or even some chicken thighs. One of my favorite ingredients to add into a braised is a splash of balsamic vinegar. It has been my go-to ingredient and after this recipe I hope y'all start to incorporate it into your braises as well. Like all braises, it should be cooked low and slow until fork tender. I wanted big bold flavors, so I added some diced bacon, demi glace, and a lot of root vegetables. The grits are truly so good! I used stone-ground grits which I feel if your cooking grits, it is the only way to go. They have so much more flavor than the quick cooking grits. So, if you can get your hands one them, grab a pack! I soaked them overnight to speed up the cooking process--they take forever to cook, fyi. I like to cook my grits in just water first. You can add the cream or milk in the beginning but I prefer to get them going and then add cream and butter. After I added the cream and butter, I seasoned with salt and then added in my chopped up herbs. For this recipe I used rosemary, thyme and chives. Another great thing to do with your leftover grits is to pour them into a pan lined with plastic wrap or parchment paper. Let chill overnight and then cut into squares and pan fry! In saucepan, combine the wine, balsamic vinegar and demi glace or beef stock and tomato paste. Bring to a boil and then reduce to a simmer and cook for 10-15 minutes. Rinse and dry brisket and then season with kosher salt and black pepper. Leave meat out at room temperature for 20-30 minutes. Heat oil in a large oven proof pot over medium-high heat. Sear the brisket on both sides, until brown all over. Transfer to a plate and pour off fat from pot. Add the bacon and cook until fat has rendered and bacon lightly browned. Add the carrot and celery to the pot. Season with a little salt and pepper. Cook for 4-5 minutes. Place brisket on top and then pour in your red wine liquid, add bay leaves, pearl onions, potatoes, garlic and fresh thyme. Cover and cook for 2-3 hours until fork tender. Making sure to baste every 30-40 minutes. In a pot, add the water and grits and cook over medium heat stirring often. After 30 minutes, add whipping cream and cook for another 15-20 minutes until grits become tender to the bite. Add butter, fresh herbs and season with salt to taste. Serve with the braised brisket and fresh chives as a garnish. Enjoy! I'm sure y'all heard of succotash before. Corn, veggies, lima beans and fresh herbs cooked, tossed or stewed together. But, for me, the version of succotash I had growing up is something taken to a whole another level. 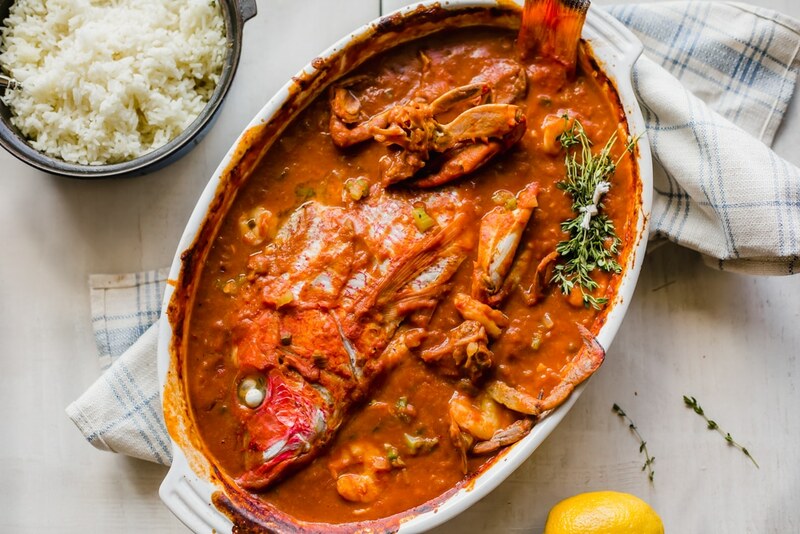 You can say it is the cousin of gumbo, the only difference is that it has a lot of vegetables and is mostly a red stew with only a little bit of roux to bring everything together. This is a dish I would put up against Gumbo and say I love more than Gumbo. My father made this dish mostly as It was something his parents cooked and prepared. Think seafood, fresh veggies, tomatoes, of course, some smokey andouille and amazing spices stewed together with a little roux. This is not supposed to be extremely "soupy" but you do not want it super thick neither. A tablespoon of roux does the trick to bring everything together and to make for a delicious meal. Take advantage of the beautiful summer tomatoes, corn and beans popping up everywhere and make this recipe asap! Being from New Orleans, I was surrounded by fresh seafood, but luckily I had some shrimp stock in the freezer and was able to find some great fresh shrimp in the grocery store. To make the recipes check out these recipes for shrimp stock and roux. I did not have any blue crabs to throw in, but if you can find some, add in those babies! While making this it brought back so many memories. Food does wonders for the soul I truly believe. I hope y'all love this recipe as much as I do. What is one recipe you still make to this day that your parents made? In a pot over medium heat, add andouille and ham and cook until rendered and starts to brown a little. Add the celery, green bell pepper, and onions, cook for 3-4 minutes. Toss in the corn and tomatoes, cook for another 3-4 minutes. Add the stock, worchestire sauce, creole seasoning, and bay leaf. Let simmer over low heat for 30 minutes. Add lima beans, shrimp, and roux. Once shrimp is fully cooked, add a pinch of cayenne and salt to taste. Serve over some rice and garnish with freshly torn basil. So, I finally bit the bullet and invested in a sous vide machine. Like for real, what took me so long!? I received an email from Chef Steps offering a discount on their Joule and just went for it. I decided to go to my local butcher shop in Downtown Mckinney and splurged on a beautiful Wagyu steak! I followed Chef Steps recipe for the Ultimate Steak Recipe and I'm not looking back! Extremely tender and juicy, the sear was on point and took no time. I paired this great tasting tangy pickled green tomato salsa verde to spoon on top! You guys are not going to want to miss this! If you do not own a sous vide machine, it is perfectly fine to cook your steak the old-fashioned way on the stove, but you don't want to miss out on this pickled green tomato salsa verde! I really want to share my experience with the Joule. This is not an ad, but want to give you some insight on what I thought about it. For one, it is small and sleek, I'm glad it wasn't a bulky one like some I have seen. My recommended cooking temperature was 129 degrees f. It took around 7-10 minutes to reach the temperature, which I was surprised by how quickly it was reached. My steak was a little bit over 1 1/2 inch in thickness, and I opted for medium-rare. Altogether, it took 1 hour in the water bath! I brought gallon size heavy duty zip lock bags and placed a few springs of thyme and butter cubes in it. I seasoned on both sides with kosher salt and black pepper, then over a hot skillet quickly seared for 1 minute on each side. Okay, now back to the recipe! The pickled green tomato salsa verde is quick to put together. Making pickled green tomatoes are really simple. I sliced them pretty thing to do more a quick pickle. As I've said before, I love pickling! This salsa verde is great to cut through the fatty delicious steak. Light and refreshing, you get a nice sweet-tart crunch from the pickled tomato's and then the earthiness and a little heat from the parsley and chile de árbol. I was happy with how it turned out and paired with the steak, I hope y'all enjoy it as much as I did! Once tomatoes are pickled, dice them and place into a bowl. Add the parsley, capers, olive oil, pickling liquid, chile de árbol, salt and black pepper. Stir and let sit for a few minutes. For your steak, you can either sous vide it (link in post on how to sous vide) or you can cook the steak to your liking. After your preferred doneness is reached, spoon some of the pickled green tomato salsa verde over it and enjoy! This past year I've been hearing all this talk about a particular cookbook, Zahav: A World of Israeli Cooking--and particularly about the amazing Zahav's hummus that Chef Michael Solomonov creates. I love hummus and love how it is a vehicle for a lot of different flavor combinations. Growing up, I just saw hummus as something you sprinkled some feta cheese and drizzled some olive oil over. Dipping a soft and fluffy pita bread into it and calling it a day. Then, back in New Orleans, chef Alon Shaya opened up his famed restaurant Shaya, which has this dish on the menu of lamb ragú with hummus. I haven't tried it yet, but it looks delicious! So, I finally took the dive to make some hummus. No canned garbanzo beans or hummus in containers, I wanted to make it from scratch, but the Zahav way. What intrigued me about the recipe was the addition of baking soda! Yes, baking soda. Which is part of the sucess for the smooth and creamy Zahav's hummus. You soak the chickpeas overnight in baking soda and it raises the pH and helps to soften the outer shell. If anyone has ever cooked chickpeas, they seem to never get soft, like, they take all day to cook! But, with this method, the cooking time went by rather quickly. So, you soak with a teaspoon of baking soda and you cook with a teaspoon of baking soda in the water. When it comes to seasoning hummus, I tend to like garlicky and lemony. But it has to be in balance. This recipe calls for you to pulse the garlic (unpeeled) in lemon juice to make garlic infused juice. Pulse and then smash the cloves down in a strainer to extract as much liquid as possible. Also, it calls for cumin, which I love. I added more salt than the recipe called for, but you can change the amounts to cater to your preference. When trying to figure out what topping to go with, of course, shrimp was the winner. I love seafood. Growing up, seafood was everywhere. Fresh from out of the Gulf of Mexico, reasonably priced, and always in dishes my parents cooked. Instead of Creole seasonings, I wanted something different. I love curry spices and the bold flavor it brings. So, I opted to roast shrimp, onions and kalamata olives in curry powder, pimenton de espelette and smoked paprika. Place the chickpeas in a large bowl with 1 teaspoon of the baking soda and cover with water. Make sure to use enough water because the chickpeas will double in volume. Soak the chickpeas overnight at room temperature. Drain the next day. In a large pot, place the chickpeas, remaining teaspoon of baking soda and cover with cold water by at least 4 inches. Bring to a boil over high heat, skimming off any scum that rises. Simmer for about 1 hour, until the chickpeas are completely tender, they can be overcooked and falling apart. Drain and place aside. Process the garlic, lemon juice and 2 teaspoons of salt in a food processor until coarsely pureed. Let sit for 5-10 minutes. Strain the garlic mixture through a fine-mesh sieve into a small bowl, pressing on solids to release as much liquid as possible. Take liquid, tahini, and cumin and pulse to combine. While motor is running, slowly drizzle in 1/4 cup of ice water until the mixture is very smooth. Add in the chickpeas and puree until the hummus is smooth and creamy. Taste and adjust seasonings. Preheat oven to 375 degrees. Toss onions, olives, shrimp, curry powder, pimenton, smoked paprika, 1 teaspoon of salt and olive oil into a bowl. Mix and spread onto a baking sheet. Roast for 10-15 minutes. Spoon some of the hummus into a bowl or on a plate and top with the shrimp mixture. Garnish with some more smoked paprika and freshly chopped parsley. Serve with some crusty bread or pita.